My friend Paul Gorbould took this picture (recently featured on the Freakonomics blog) and it’s worthy of consideration from a business ethics point of view. The picture happens to have been taken at a public building (at the Joggins Fossil Cliffs, in Nova Scotia), but signs much like this one are popping up at business establishments, too. As the comments at the Freakonomics blog point out, there are plenty of problems, here. What does “alternative” fuel mean? Is diesel an alternative fuel? If not, why not? What about E85, which is basically a mixture of ethyl alcohol and gasoline? Why should a tandem pickup burning (lots and lots of) E85 get parking priority? How about a hybrid SUV? A hybrid SUV burns more fuel, and is worse for the environment, than, say, an “old fashioned” subcompact car burning unleaded gasoline. Why give it special parking privileges? But there’s another important issue here: even if it were clear what counted as “alternative” (which it’s not) and even if “alternative” SUVs really deserved special parking (which they don’t) there’s still an issue about what sorts of values, in general, we promote through special parking privileges. 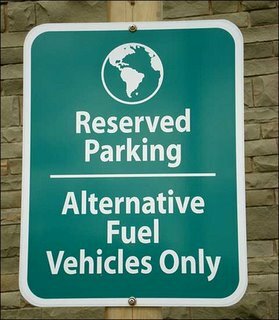 Note, for example, that every parking space reserved for alt-fuel vehicles is thereby made unavailable for, say, handicapped parking. Or for parking for pregnant women and new mothers. Or for motorcycles and scooters and bicycles. A business can, of course, have special parking spots for all of the above, and still have room for the rest of us — if they’ve got a really big parking lot. But still, someone has to get the spots closest to the door. In making a move to promote a particular value (like environmentalism), organizations need to think not just about what values they’re promoting, but about what other values they’re de-emphasizing at the same time. Another interesting twist: an environmental certification system may be behind this silliness. One of the people who left a comment on the Freakonomics blog pointed out that under the Leadership in Energy and Environmental Design (LEED) Certification system, builders get points towards certification if they provide parking for alt-fuel vehicles. The Joggins Building is LEED Certified. It’s unfortunate when well-intentioned certification systems encourage poorly-justified moves like this. I would have thought that an environmentally conscious building design would actually encourage people to walk or take alternative transport. I’m actually a bit puzzled by the fact that part of LEED certification encourages car use. Anonymous:Walking sounds great in principle, but it just isn’t an option, for getting to some places. Like to World Heritage sites that are over an hour from the closest city!But more generally, your point is consistent with mine: why not reward people who get there by bus? Or who car pool? Or who….you get the picture!Chris. Kevin:An objective definition would be nice; but I’d settle for even a vague-but-reasonable one.Regards,Chris. I must agree with Kevin. Living in Alberta where most of our energy is coal generated, (which I own) may be wiser. But in addition to that, if we really jump on the electric car band wagon, will the increased demand on electricity cause electricity prices to go up? And if so, will we regularly suffer brown outs? As well, since we all need electricity, will those on fixed incomes or in a low income bracket suffer due to higher electricity prices? Sometimes I think people who jump too quickly onto bandwagons have tunnel vision and do not do their homework. Getting a parking spot closer to a mall, for example, where I can consume more is not going to make me switch nor will it necessarily help the environment. Anonymous:Fair questions.One quibble: a rise in electricity prices is unlikely to produce brown-outs. Quite the opposite. As price goes up, demand is likely to go down (a bit). Brown-outs are caused by <>excessive<> demand.Chris.